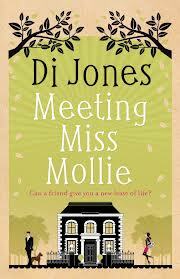 Blogger's Note: After reviewing Di Jones' second novel yesterday (read it here), I'm pleased to welcome the author to the blog, today, for an interview as part of her Chick Lit Plus blog tour. Change the Word: What is one trait you share with the main character in this book? Di Jones: The main character in this book is Annabelle, the Agony Aunt, and this character is not a lot like me, so this question is quite hard to answer. Mmm…I guess if I have to come up with one thing, it’s that I eat too much and don’t exercise enough, although by the end of the book, Annabelle is improving in that sphere. I guess I need to take a leaf out of her book. CTW: How to you get yourself ready to write? This approach is far more productive! CTW: What's one self-editing tip you can share with aspiring authors? DJ: The best advice I was ever given myself about self-editing is to start a spreadsheet of all the things you know you should look for in editing. Then when you get to the editing stage, refer to the spreadsheet and do everything you’ve recorded in it. This makes your editing more systematic, but can also make it a very long process. The thing to remember about editing is that it’s like putting stones through a tumbler – you’ll come out with something beautiful if you persist long enough. CTW: Do you have any must-have snacks/comforts when you write? If so what are they? CTW: If you were to write an autobiography of your life, what would be your title and why? DJ: Living Many Li(v)es: The Exaggerated Adventures of an Ordinary Person. This probably sounds a strange title, but it’s a good one for me. I’ve lived in England, Canada, New Zealand and the U.S., and I’ve done a variety of jobs, so I feel as if I’ve lived a whole lot of lives all bundled up in one. And of course, one of the qualities of a storyteller is the ability to exaggerate. CTW: If you could trade places with any person for a day, who would it be and why? DJ: I’d love to trade places with a talented and famous writer, to see what it feels like to be at the top of your game, and to absorb their work practices and mindset. My choices would be either Jodi Picoult, Jill Mansell, or Janet Evanovich. CTW: Who is your favorite character in fiction? DJ: My favorite books are the Chronicles of Narnia by C.S. Lewis, and my favorite character is Lucy, from those books. Lucy is the young girl who discovers Narnia when she’d hiding in a wardrobe in the book The Lion, The Witch and The Wardrobe. I love that Lucy is the one that discovers Narnia, the friendships she makes there, and the way we see her grow and mature during the series. CTW: Who is your favorite literary leading man? DJ: Definitely has to be Fitzwilliam Darcy from Pride and Prejudice. He’s the archetypical romantic hero, cold and aloof, but underneath that exterior he has high morals, and is kind and has high integrity. My favorite film depiction of Darcy is by Colin Firth, who played Mark Darcy in Bridget Jones’s Diary. Helen Fielding, who wrote this book, admitted that it was based on Pride and Prejudice. CTW: What's one little secret about yourself you can share with us? DJ: I’d love to give you an honest answer to this question, but here’s the problem. If I did, it wouldn’t be a secret anymore. CTW: Anything else you’d like to share? Tessa Taylor leaves her home in Washington DC to pursue her dream of becoming an actress. But Tinseltown is tough, and the road to stardom isn’t as straightforward as she hopes it will be. Tessa has to compromise to make ends meet as she pursues the dream, and work is hard to come by in Hollywood. She tries one job after another, and they all end in disaster. Until one day she finds the perfect job – and the perfect group of new friends. I was born in Liverpool, England to parents who had a strong sense of adventure and moved many times. I’ve lived in Canada, the United States, England and New Zealand. I’ve worked in a variety of jobs ranging from envelope stuffer to bakery assistant, librarian to trade development executive, but none of my jobs were as much fun as the one that allowed me to write and get paid for it. That was a few years ago, and each year it’s become more and more apparent what I want to do is write full time, a dream that first occurred to me at seventeen. I write chick lit – light hearted and humorous stories for and about women who value their families, their friendships, their careers, their independence, who have a sense of adventure, and who live and love with passion. Like my characters, I love my family and friends, beautiful shoes, anything sparkly, the ‘occasional’ drink, parties, and a good belly laugh. I’m addicted to shopping, chocolate, bubble bath and anything else that smells nice, and the sort of tv programmes you’d never publicly admit to watching. I live in a lovingly renovated home overlooking Auckland’s beautiful Waitemata Harbour, with my trusted friends Bronson Boxer and Dolce Dane. They keep me fit and exercised, scare the burglars away, sit loyally by my side throughout my late night writing sessions, and hang on my every word when I read final drafts aloud. They truly are my biggest fans, and I theirs! I love my life, but not so much that there’s not room to live a load of other lives, through the hearts and minds of my characters, all of whom I adore, and some of whom I’m fortunate enough to call friend. Enjoyed reading this interview ladies!